Taking a cue from the favourable rainy season, and more of a luck, I introduced a few new kids on my gardening block. I was thinking to bring about these kids in the family for quite some time, just that, either I didn't find time to get them, or didn't find the luck to find these. A few weeks earlier, during my visit to an armed forces canteen with my father, I went to the nearby attached plants nursery which goes by the name of the armed forces shopping complex I went to. And, I just asked the owner of the nursery about these - "The Lillies". I wanted to have some lillies for quite some time. I just asked him whether he has any bulbs, and to my luck, I got an affirmative answer. He sent his helper to check whether they still had any lily bulbs, and if there were any, to fetch the container that had the bulbs. He went on and came back after a few moments, with a small earthen pot, which had a few lily bulbs that were soaked in water. I was happy to find the much awaited lily bulbs, and suddenly, it struck me to ask the nursery owner about the variety of the bulbs. I asked him, and he said, this is the Amaryllis Lily. I wanted to have the other species too, the Asiatic, Oriental and Tiger lily, but was told that all these bulbs would be available somewhere near november. So, I grabbed what I got, selected four of the healthiest bulbs, and came back home with them. I removed the now rotting upper layers, which had a few larvae, removed all these rotten layers, and put up the lilly bulbs in a pot. A few days passed by, and some new leaves peeked out of all four bulbs. After a few more days, one of them died, and I'm now left with only three. So, I'm waiting for these lily bulbs to grow and bloom, maybe, next summers. Till, then, I'll try getting other variety of lillies in my gardening space to accompany these. For now, I'm having one spider lily plant, and these Amaryllis lily plants. 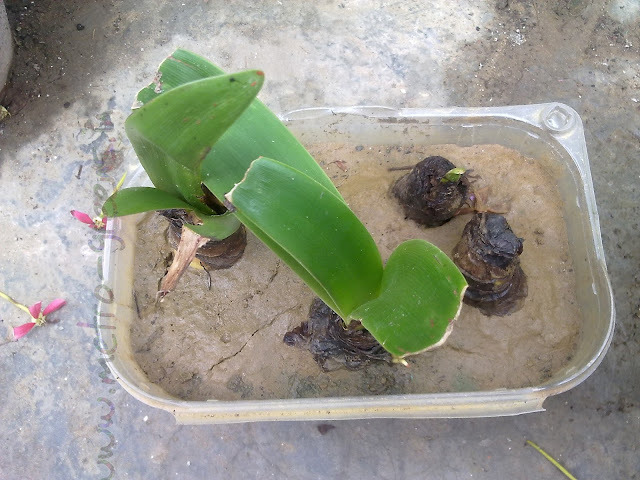 The lily bulbs put up in soil to keep them alive till, I transplant them in a pot of their own. The bulbs finally transplanted to the pot. Only three survived. I’ll be back with some more things for you. Right now, one of my beans is bearing fruits. I’ll show you what I’ve got from this bean stalk in the next post. Till then, keep visiting and HAPPY GARDENING! Well Ajeet, this will definitely be the start of a long and beautiful love affair for you... I just absolutely love the Amaryllis. My Amaryllis bulbs have multiplied over the years and with almost no effort on my part, I get to see such beautiful blooms year after year! So enjoy.. Thanks for visiting Sujata. This is true for bulbous plants. 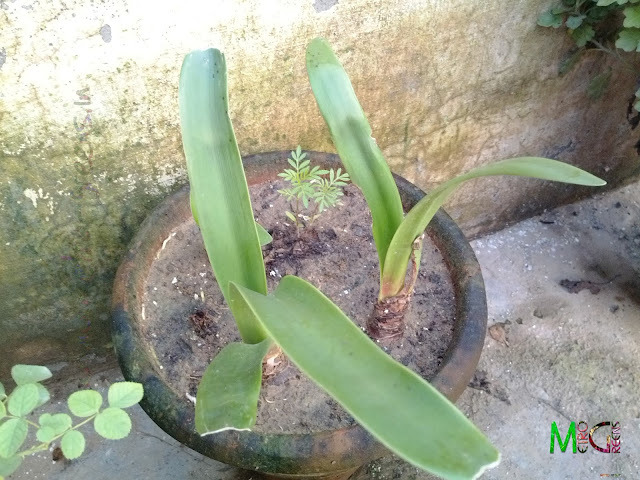 Even my Rajnigandhas have grown and multiplied over years, from just 4-5 bulbs to now growing in two large containers and I have happily distributed to some friends and colleagues who were interested in having those. I do hope that You continue to see wonderful blooms for years to come and I expect the same for me too. Well, good thing you got what you were looking for. As I don't know much about this species of lily, I will wait for the flower to bloom. :) Best of luck. Thanks, Pankti, for taking time and visiting my space. I too don't know a lot about lillies, except that their blooms are wonderful. Sujata (http://ourdhara.blogspot.in/) has a some wonderful lily plants in her garden. I'll try to find other varieties too, and will share them here.